View More In Vehicle Covers. Speed-Way Motorsport Shelters are custom/private miniature motorsport garages with a retractable roll-top feature that allows fast and safe access to your bike. The main features of Speed-Way shelters are weather proofing, ease of assembly and use, strong and durable materials and construction, custom designs with functionality and affordability. Simply pull your bike straight into a Speed-Way Motorsport Shelter, lower the retractable cover over your bike and you are done. You can be assured that your bike is fully protected and there is no waiting for pipes to cool. It comes in two sizes for your convenience. 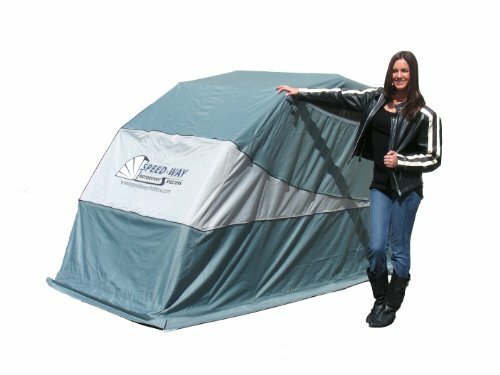 Speed-Way Motorsport Shelters fits virtually all standard, sport motorcycles as well as scooters, many ATVs, bicycles, riding lawn mowers, and can even be used as a firewood shelter. If you have any questions about this product by Speed-Way, contact us by completing and submitting the form below. If you are looking for a specif part number, please include it with your message.